I was really excited to give this new Ohto Needle-Point Slim Line 0.3mm ballpoint pen a twirl as soon as I saw it show up in JetPens new product feed (they have been on quite a roll lately fyi). First off, it is an Ohto, whose pen designs I really enjoy, and secondly, it is an 0.3mm ballpoint. Not 0.4mm like the Zebra Techno Line, and not 0.5mm like the Uni-Ball Jetstream, but 0.3mm. Easily the finest tipped ballpoint I have used. My expectations of this pen were so high that I wanted it to be perfect, and like many of us find from time to time, things have a hard time living up to perfection. I'll say right offhand that this is a really cool pen and one I will keep using, but there are a few little things that get to me. The largest culprit is the ink line. What I found as I was writing was that if I kept a reasonably vertical pen barrel angle I wouldn't have many problems, but if I had a lower angle there would be a fair amount of skipping. I think that is a function of just how fine this pen is and that there isn't much room for error. Additionaly, the pen barrel is to thin for any long term writing stints. Again, I think this is due to how fine the tip is. If you had a thin barrel and a wider tip, you could write in a more flowing style without as much stress. I felt like I was gripping pretty firmly to get the pen to do what I wanted it to do. The overall feel in the hand was fantastic though. The barrel is made completely out of metal, and I love how the knock is a conical shape as opposed to the more standard vertical walled design. At $7.50, it isn't cheap to not completely love, but it has so many good things going for it I am going to keep it well within arms reach. 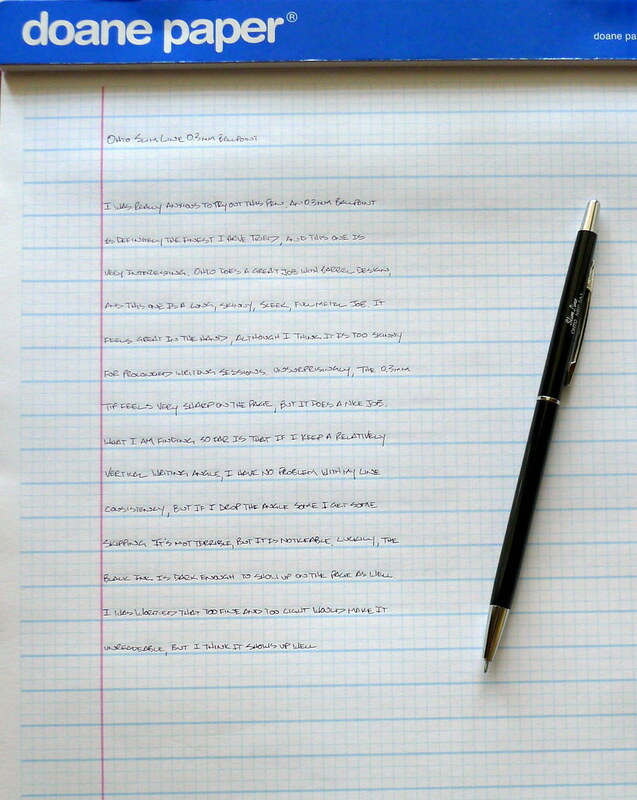 Posted on April 6, 2011 by Brad Dowdy and filed under Ballpoint, Ohto, Pen Reviews.